Charlton Heston with some suggestion on how to write a book review. Writing in The Conversation (http://theconversation.com/here-they-are-the-rules-for-book-reviewing-28732) on 9th July this year Professor John Dale launched a somewhat surprising, if clichéd, attack on book reviewing in Australia. The title of the piece ‘Here they are: the rules for book reviewing’ provides us with a hint of what is to come. The accompanying picture of two crows observing a pair of reading glasses resting on a book seemed oddly out of place. 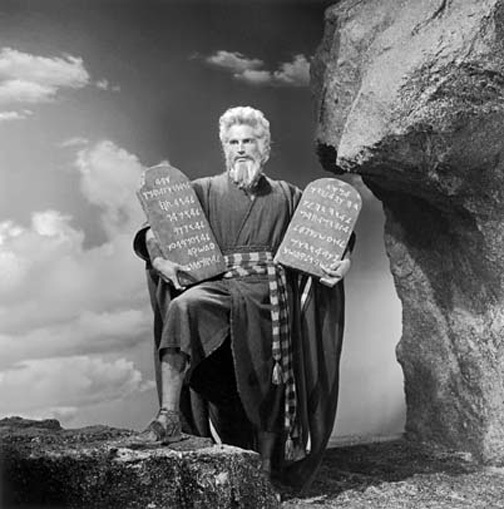 I would have thought Mosses carrying the stone tablets with “the rules” down the mountain would have been a more suitable image for such a title. The opening paragraph suggests there is little hope for us. We are told that, while there might be the occasional exception, “in Australia reviews are often bad in many different ways” and “it is generally acknowledged, however, that the standard of book reviewing in Australia is poor”. What’s more we don’t have a powerful figure such as James Wood striding the Australian reviewing landscape….and just in case you are wondering who James Wood is a link is provided to the New Yorker where we learn (in case we don’t know) that: “James Wood has been a staff writer and book critic at The New Yorker since 2007. He was the chief literary critic at the Guardian, in London, from 1992 to 1995, and a senior editor at The New Republic from 1995 to 2007. His critical essays have been collected in two volumes, The Broken Estate: Essays on Literature and Belief (1999) and The Irresponsible Self: On Laughter and the Novel (2004), which was a finalist for the National Book Critics Circle Award. He is also the author of a novel, The Book Against God (2003), and a study of technique in the novel, How Fiction Works (2008). He lives in Boston, and teaches half time at Harvard University, where he is Professor of the Practice of Literary Criticism”. Obviously we cannot hope to reach such lofty heights here in Australia….. Try to understand what the author wished to do, and do not blame them for not achieving what they did not attempt. Give them enough direct quotation – at least one extended passage – of the book’s prose so the reader can form their own impression, can get their own taste. Go easy on plot summary, and do not give away the ending. If the book is judged deficient, cite a successful example along the same lines, from the author’s ouevre or elsewhere. Try to understand the failure. Sure it’s theirs and not yours? Wouldn’t you know it, most book reviews written in Australia break at least one of these rules. So now we know what we should do – follow the 5 rules of good book reviewing and all will be well. Perhaps I’m being a little flippant here but really Professor Dale seems to have approached the whole topic of book reviewing in Australian with the “shallowness” and “sloppiness” he accuses the vast majority of Australian book reviewers of. Peter Rose, the current editor of Australian Book Review, points out in his response to Dale (http://theconversation.com/in-defence-of-book-reviewers-in-australia-29037), that the good Professor hasn’t researched his topic in any great depth. Rose points out that Dale claims that “Many scholars don’t have the time to spend a day reading a book and then writing an insightful review for A$120”. Rose points out that ABR pays a minimum of $300 a review. Many journals pay less than $100. Maybe Dale is thinking of a newspaper – but he doesn’t give us any more details. Dale goes on to say that, because book reviewing pays so badly in Australia, “it invariably falls to the second-rate, the hack who skims the text and summarises the blurb and whose real motive for reviewing the novel in the first place is to see their name in the book pages”. It is at this point one really has to ask what was Dale’s motive in writing this attack piece? What reviews has he actually read? Is he talking about the book pages of the major Saturday newspapers? Is he attacking ABR? The various literary journals that publish reviews – (http://cordite.org.au/content/reviews, http://mascarareview.com/,http://www.verityla.com/ to name a few)? Is he aware of the Sydney Review of Books (http://www.sydneyreviewofbooks.com/)? It obvious he has never read Rochford Street Review. In the end Professor Dale fails by the standards he demands others follow. His piece makes accusations which he doesn’t back-up – he doesn’t refer to a particular Australian review or reviewer to support his claim. If you are going to attack everyone who writes book reviews in Australia then why not refer to some actual reviews as examples of the faults that are apparently endemic in the Australian Book industry? I’m sorry Professor Dale, I have a much more positive view of the diversity and quality of book reviewing in Australia. And as for your ‘rules’……. Rochford Street Review relies on donations to cover costs. Any funds left over are used to pay reviews. Unfortunately it is unlikely that our donation pool will permit us to pay reviewers $120, at least in the short term…….